Fits Compass S-150. [Usage] Wood diagonally in vertical and horizontal directions. Can cut in smooth curve. Also great for pocket cutting. [Features & Functions] Designed for cutting tight curves, circles on the sawn wood, plywood, laminated wood, etc. Replacement blades of the Compass series can be used. Impact quenching is given to the cutting edge, and it is excellent in toughness and durability. The attachment and detachment of the blade is screw type, so it is safe and easy. 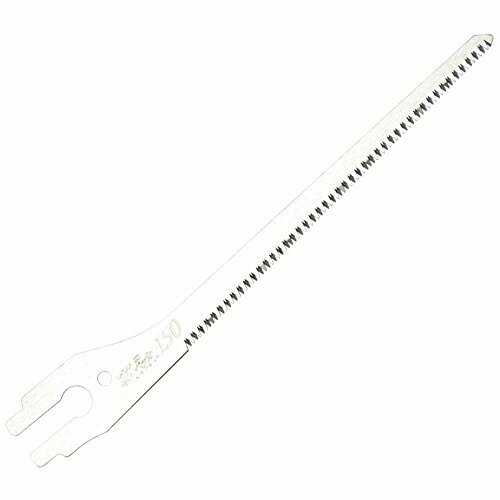 For securing clear sight of cutting line, the saw blade can be attached in reverse to the handle depending on the usage of the saw. Because the width of the blade is small, it is very flexible and easy to cut. Comes with a case which is convenient for storing it. Great for DIY works. Electroless nickel phosphorus plating prevents the blade from rusting. [Material] Blade: SK 5 Okada Hardware is one of the leading pioneers in the Japanese handsaw manufacturing industry established in 1943 and naturally followed the great handsaw manufacturing tradition while simultaneously introducing extensive modern technology into the whole saw manufacturing process. If you have any questions about this product by Z-saw, contact us by completing and submitting the form below. If you are looking for a specif part number, please include it with your message.